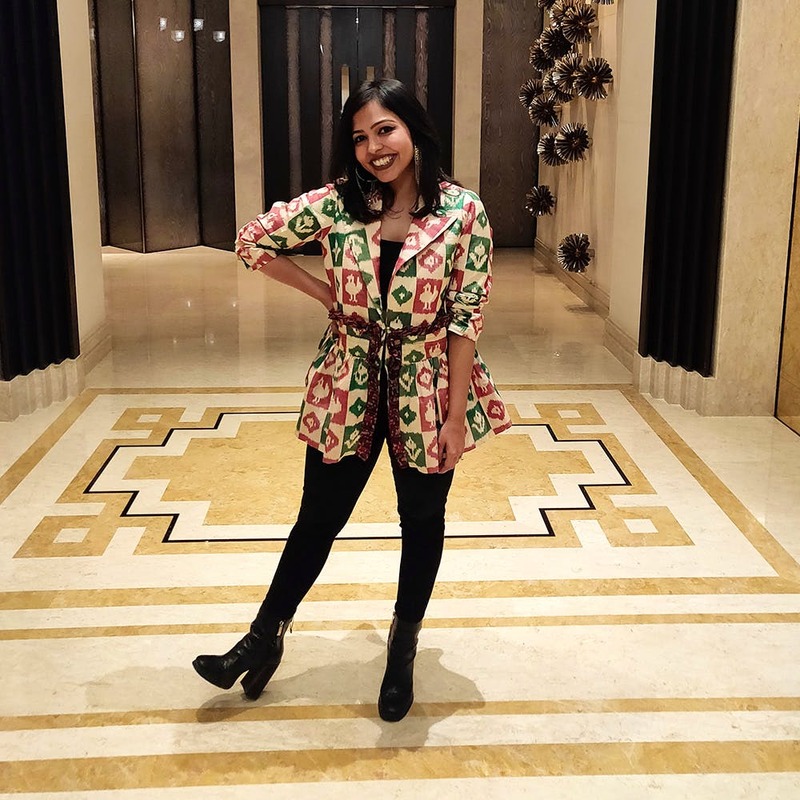 Karishma Sehgal who landed in Chennai only a few months ago begins her fashion journey with The Baksa Project, a label that specialises in sustainable clothing. At a time when everyone is moving towards a more sustainable lifestyle, The Baksa Project by Karishma Seghal is a welcome move. Why you ask? It is because The Baksa Project comprises stories, illustrations, and projects about how sustainable fashion can be made fun. Karishma designs garments under two sections- vintage and upcycled. The garments under the vintage projects are made using vintage fabrics - mostly sarees that she sources from her mother, grandmother and great grandmother's closets. These could date back to as early as early the '70s and as late as the mid-90s. We absolutely love The Pochampally Ikat Silk Jacket that she made from her great grandmother's saree from 1975. What blew our mind is that she has kept the beauty of the weave intact and yet the piece look gorgeous. There is also a Narayanpet Cotton Frill Dress that is made from her mother's saree from 1992. As for her upcycled garments, they are new. If you have a stained jacket sitting ideal in your wardrobe, give it to Karishma who will give it a new spin. How? She upcycles these garments using recycled material like soft drink cans, unused embroidery threads, beads from a broken piece of junk jewellery, etc, in interesting ways to make it wearable, artistic and personal. These garments are a lot more quirky and experimental. She made a piece with her father's stained old shirt that she upcycled with embroidery and soft drink cans as embellishments. We also are impressed with the old and worn out denim jacket upcycled with patches of denim scraps and simple embroidery. The next big question is if sustainable fashion is expensive. Not really, says Karishma. It is really about looking at reusing, mending and repurposing clothes that you already have instead of mindlessly buying new clothes. Give her any fabric and Karishma can weave her magic on it. She recently finished constructing a beautiful skirt by deconstructing two of her mother's old kurtas that she hasn't touched in over 20 years. The idea is to repurpose fabric from clothes. Also, she believes in zero-waste. So, whatever fabric is left off in the process of garment construction is reused in the construction of another garment. Karishma also conducts workshops at equipping people with the basic skills one needs to repurpose and reuse their old clothes while also having fun in the process. She recently conducted a workshop on Visible Mending - a Japanese-inspired mending technique. Her next will be 'Storytelling Through Embroidery'.